Please note that during Easter Weekend, only The Commons will be open for service. Friday hours are 7am - 7pm. Saturday and Sunday will feature Brunch and Dinner at our usual hours. Growing up, Nou Chang never imagined she would spend three months studying in another country. As a Hmong woman, studying abroad was not culturally accepted, nor was it financially feasible for her family. Despite these obstacles, Nou is "in a dream" in Seoul, South Korea where she is studying for a semester at Yonsei University on a Council on International Educational Exchange (CIEE) program. She applied for and was awarded the Gilman International Scholarship Program, which offers grants for undergraduate students of limited financial means to pursue academic studies abroad. 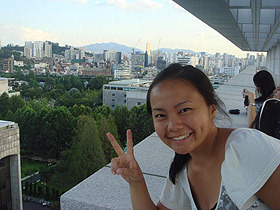 A double major in biology and English, Nou sees the CIEE program as an opportunity to learn about the education system and the medical practices of another culture, to interact with Koreans and learn specifically about the people and culture, to attend a prestigious university, and to enhance her overall college experience. In her scholarship application essay she wrote, "The program will contribute to my college experience in that it will make me a more rounded person to go out into the world as an educated leader in the community." In her blog, "Seoul: An Asian American perspective of South Korea," Nou shares her experience, including her reasons for studying in South Korea and the exhilaration and frustration she feels as a U.S. American in another country. Out of all the places, why South Korea? There's the pop culture, kimchi, bibimbap...yet, what really drew me to South Korea was its reputation to adopt its children. [The] United States contains the largest Korean adoptee population in the world. My interest in South Korea's health system as well as its orphanages drew me to explore and understand the Korean culture in a deeper level. So here I am--the motherland. I hope to gain a better understanding of Korea and most importantly I hope this journey will help strengthen my vocation. Nou writes about her frustration at not being able to understand people or to read the signs but says she is becoming more independent and learning to discipline her spending habits. At the beginning of her experience, she writes, "After being in Seoul for a week, I feel better and more confident in my surroundings. I still feel like I am lost in this big city. There's so many things to do--touring, shopping, etc--but the problem is that I don't know any Korean so I can't ask questions or bargain. I don't even know how to say 'where is the bathroom?'!" She has a ten-minute break between her classes, and they are on opposite sides of the campus separated by a hill with steep steps. She writes that walking up the hill at Yonsei University nearly brings her to tears. "I could use the workout but it's just that my backpack is so heavy!" She is glad to have packed sturdy tennis shoes but marvels at the women who climb the hills wearing high heels. Two weeks after her arrival, Nou was visited by Ashley Stoffers, an Augsburg student teaching in English in South Korea on a Fulbright Scholarship. Ashley brought Nou an early birthday present--a "Korean survival package." Nou wrote that the visit and the gift helped cheer her up after having a "not so good" first couple of weeks. To complete her program, Nou will create a film documenting her experience and that of other students in South Korea. "I hope to show my peers in the states the daily life of an "American student" studying in South Korea through film..." She hopes to dispel myths surrounding the study abroad experience and that her film will educate potential students and encourage them to pursue study abroad opportunities. "My film will be proof that a Hmong American student was able to successfully complete a semester away from home with the help of the Gilman Scholarship. I believe that my film will help fuel the Hmong college students' flame to study abroad. It will also help dissipate any lingering doubts concerning living abroad." To read more about Nou's experience, go to http://nou-southkorea08.blogspot.com/. For information on study abroad, go to www.augsburg.edu/augsburgabroad.